While in New York City for his co-op, Pratik Shirish Kulkarni was able to take in the sights with his fellow interns. 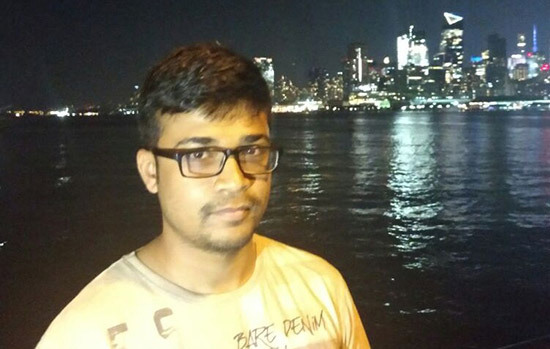 Pratik Shirish Kulkarni is a second-year student who came to RIT from Mumbai, India. After completing his bachelor’s degree in computer engineering at the University of Mumbai, he wanted to take his education a step further by earning a master’s degree in computer science. Over the summer, Kulkarni completed a 13-week co-op for UNICEF International working with data collecting. When he applied, the co-op was supposed to be a remote position, where he would work from RIT. But to his surprise, the co-op changed to an on-site position. He had two weeks after finals to pack his things, and Kulkarni began his experience living near New York City and working at the UNICEF International Headquarters. Kulkarni has been invited to speak about his experience using technology to help a humanitarian organization at the 2017 Election Night Hackathon. The event is from 5 to 10:30 p.m. on Tuesday, Nov. 7, at the RIT MAGIC Center. Open to the public, the event is aimed at learning about civic hacking and working on individual hacking projects with friends over pizza and snacks while waiting for the election results. To RSVP for the event, go to bit.ly/ElectionHackathon2017. Answer: When I was applying to colleges to get my master’s degree, I was looking at their different curriculums offered in respect to what I wanted to do and what future prospects each college offered. RIT was one of the best that I had looked at. A couple of my classmates from India had done their master’s at RIT before me, so I learned about the school from their reviews of the courses and how it helped them get a job in their field of interest after graduation. They all had amazing experiences to share, so that’s why I decided to come to RIT. Q: Why were you interested in the UNICEF International co-op? A: When I saw UNICEF listed on the Job Zone, it really caught my eye because they were looking for computer scientists. I wanted to see what they worked on and what sort of applications they have, and what I could do to help with it. They had a couple of interns from RIT in the past who helped them develop an internal job portal for the organization. I figured that would be something that I might work on, but when I spoke to some of the people from UNICEF in my interview they told me I would be mainly focusing on big data and data distribution. I was immediately interested because I want to work in that area of computer science. It was also a really good chance to see how humanitarian organizations make use of different software. We all know companies like Amazon and Google use this kind of software, but UNICEF is also using this software to help them help people around the world. Q: What did you do at UNICEF International for your co-op? A: UNICEF is building a platform to fetch data from various public and private sources. The data includes population, mosquito prevalence, cases of epidemics, mobility of people between different countries, etc. This data can be used by data scientists as well as other humanitarian organizations. For example, if I know that people from RIT come from Henrietta and other locations, I can predict how people would move from RIT if there was a big flood. By tracking that I can see how emergency alerts should be distributed. If there is a flood at RIT, some water-borne diseases might spread from RIT to those other locations. Because of the data we have, we know what areas should be notified of the risks. There is no limit on how you can use that kind of data to help with information distribution in an organization like UNICEF. This platform doesn’t only apply to natural disasters either. They get all kinds of data from public and private sources that helps inform their decisions and actions as a humanitarian organization. The project I’m working on focused specifically on mapping schools. They are mapping all the schools in the world and collecting details like how many students there are, how many girls and boys there are, what level of internet connectivity do they have, and other things. I worked on fetching and cleaning the gathered data as well as storing it in machine readable format. I also worked on building an API to serve this data. I added caching, user tracking and authorization layer to the API. Q: What was one of your favorite memories from the co-op? A: There are so many good memories. Being a part of the team was really nice. As a team, we would go out every Friday night and that was really fun. The team was very nice. Also, everyone on the team was from a different country. I got to work with so many different people, like people from India, Sudan, Pakistan, Australia, Argentina, Spain and more. We would all work together every day, have lunch and talk about our different cultures. There was always a good discussion. I wasn’t sure when I first signed up if I would be able to manage everything, but it all turned out really well and the team helped make things easier. I was very lucky that they changed that position from remote to on-site. Q: You’re speaking about your co-op experience at the 2017 Election Night Hackathon. Can you give a taste of what people can expect from you? A: I plan to focus on how UNICEF uses and benefits from this kind of technology. The same methods students may use as hackers could also be used by someone working in the humanitarian sector. I will try to explain how our different technologies are helping that area and talk about what I learned while working at UNICEF. I will give them a brief demo of what I have done for UNICEF and explain how it works. If there is someone at the hackathon who may want to participate in humanitarian work, this will hopefully help them because they can look and see how UNICEF is operating in that area, and even use the data I’ve helped pull together for their own projects. The data and programs I am working with is all open source, so anyone can go and download it to use. Felicia Swartzenberg compiles “Student Spotlights” for University News. Contact her at fds9410@mail.rit.edu with suggestions.